The annual budget has been aptly described as the best measure of the state’s priorities. Each year, lawmakers must distribute state funds in ways that meet basic needs, maintain critical infrastructure, ensure basic health and safety and invest in the future—most critically for children. How lawmakers divide up the state budget has the potential to help or hinder children’s development and ability to learn, create or limit economic opportunities for families and communities, and protect or threaten public health and safety. Through its Kids Count program, the League documents outcomes for children and their families, including racial and ethnic disparities. 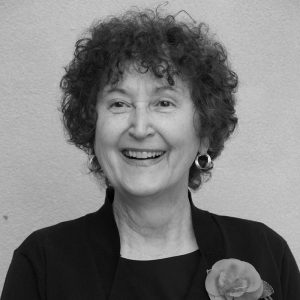 The League has as a primary goal equity for all children and knows that to get there, policymakers and the public must first understand and acknowledge that inequities exist. Job one is to educate ourselves and our community leaders, which is only possible if there is adequate data to inform budget and policy decisions. There is a tradition of close and ongoing monitoring of economic data including, for example, Gross Domestic Product (GDP) and the Consumer Price Index (CPI). Our children deserve the same. But documenting indefensible outcomes for children of color and their families is not enough. For every negative outcome there is a backstory—a history of inequality based on race, income and place. Michiganians share a value of opportunity for all children, but the data show us that good intentions have not always resulted in good outcomes. 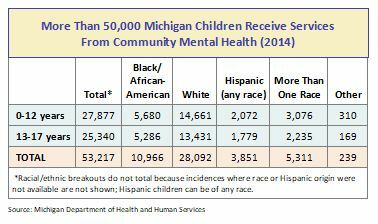 Michigan cannot afford to take lightly the undeniable obstacles being faced by its growing number of children of color. 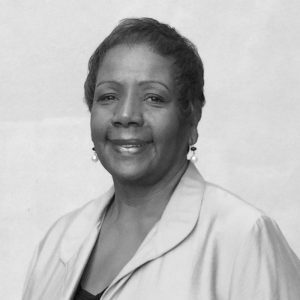 To move from indexing inequality to making change, lawmakers and other leaders must be intentional in facing the true impact of the policy and budget decisions they make on children, families and communities of color; they must support investments that help remove the long-standing structural barriers to opportunity for all children. These systemic barriers have their roots in historical racism and discrimination, but persist today in part because of budgets and other public policies that do not recognize the extra resources required to overcome the cumulative effects of inequities based on race and ethnicity. The data are clear. Families and children of color are being held back from many of the traditional pathways to economic opportunity and security. Given the growing diversity of the state, this threatens the economic growth all state residents depend on. The rising economy has not lifted all boats. Lower unemployment rates in Michigan have not translated into secure employment for all families. More than half of the state’s African-American children live in families where no parent has full-time, year-round employment, along with 40% of Hispanic/Latino children or those of two or more races. Children of color are two to three times more likely to live in poverty. Despite overall improvements in the state’s economy, the number of children living in poverty has remained stubbornly high, particularly for children of color. More than 1 of every 5 children in the state lives in poverty, with child poverty rising from 19% in 2007 to 22% in 2015. Most unacceptable is the fact that nearly one-third of Latino children or children of two or more races lives in poverty, as do half of African-American children. Even larger numbers of children are living in homes where it is difficult to make ends meet. 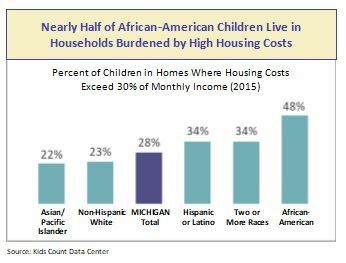 The League has estimated that a single parent with two children under age 5 would need to earn approximately $47,000 per year to cover the costs of housing, child care, food, transportation and other personal expenses.2 Almost 3 of every 4 African-American children in Michigan, along with 2 of every 3 Latino children, live in households with incomes of 200% of poverty or less (approximately $48,000 per year). Housing is unaffordable for many families. Nearly half of African-American children, and over one-third of Latino children or those of two or more races, live in homes where housing costs are particularly burdensome, representing more than 30% of monthly income. 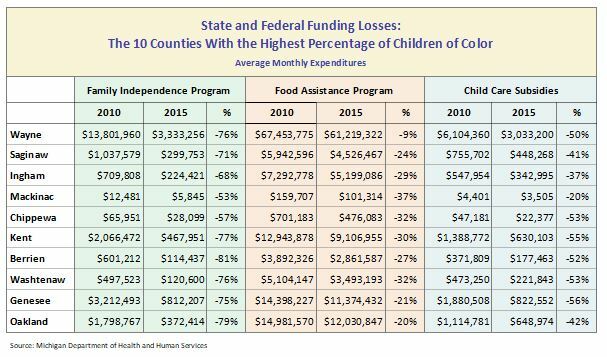 Budget Decisions Affecting Economic Security: Despite continuing high rates of poverty and economic insecurity for the state’s children, and particularly for children of color, state funding for programs to ensure that children’s basic needs are met has plummeted. The result has been continuing struggles for families with children, as well as the shrinking of funding to low-income communities. A continuation of the “heat and eat” policy. The final budget authorizes funding for the “heat and eat” policy, which increases food assistance for nearly 340,000 Michigan residents. Four of every 10 recipients of food assistance are children. 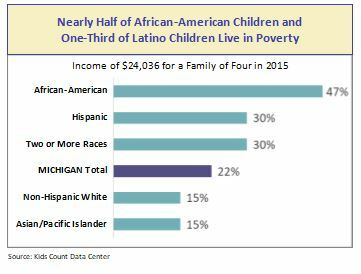 Given income inequalities based on race and place in Michigan, this expansion is likely to improve the health of thousands of children of color as well as their parents. A small investment in access to healthy food. Federally-funded food assistance does not ensure access to healthy food. The 2018 state budget includes: (1) $750,000 in the current budget year and $380,000 in the 2018 budget to match a three-year federal grant to encourage the use of food assistance dollars for healthy foods; (2) $500,000 ($250,000 in state funds) for the purchase of wireless equipment by farmers markets so families can use their Bridge Cards to purchase healthy food; and (3) an additional $10 million in federal funding for nutrition education programs for persons receiving food assistance. 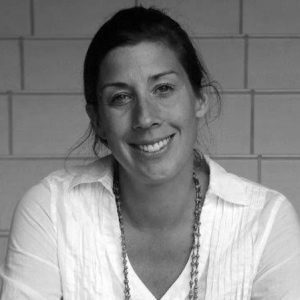 The Legislature failed to fund a Michigan Corner Store Initiative that was intended to provide grants to small food retailers to increase the availability of fresh and nutritious foods in low- and moderate-income areas. Continued to endorse policies that have led to the decline in funding for income and family support programs. The 2018 budget fails to reverse the state’s dramatic disinvestment in income support programs for families with children, which has pushed the number of Michigan families receiving Family Independence Program (FIP) benefits to its lowest level since 1957. The dismantling of this basic needs program has had a disproportionate effect on children of color, whose parents have been less able to take advantage of economic recovery and job growth in the state. More than 70% of the recipients of FIP are children—many of them very young children of color. Rejected a small increase in the clothing allowance that was proposed by the governor. The Legislature ultimately rejected a small increase in the school clothing allowance for children in families receiving income assistance through the FIP. The clothing allowance remains at $140 per child per year. Expanded the Pathways to Potential program. The Pathways to Potential program, which places “success coaches” in schools to identify barriers faced by students and their families and makes appropriate referrals for services, is in 259 schools in 34 counties. The final 2018 budget increased the program by a total of $4.9 million. Pathways to Potential is intended to work with families through their children’s schools and in conjunction with community partners. It is a promising model for a two-generational approach to the barriers facing many families of color and parents with low incomes. Expanded funding for child care services that parents need to find and keep jobs that can help them support their children. The Legislature increased funding for child care by $19.4 million (including $8.4 million in state funds) to increase reimbursement rates to child care providers, as well as $5.5 million to raise the eligibility threshold for a child care subsidy from 125% of poverty to 130%. Child care costs are some of the largest that families face, rivaling housing and even the price of a year of college. Without assistance, many parents are either forced out of the workforce or required to rely on relatives or neighbors who may be facing health problems or other hardships of their own. A family with wages of 150% of poverty (approximately $29,000 per year for a family of three in 2016) would need to spend over 60% of its income to place two children in a child care center; a family child care home would consume nearly half of the family’s income. 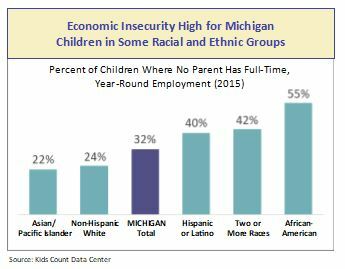 The median family income for an African-American family with children in Michigan in 2015 was $27,200—two and a half times less than the median income for non-Hispanic White families at $71,600.7 The high cost of child care perpetuates disparities in income as more families of color are unable to afford the child care they need to work. High child care costs relative to family income also further hamper children’s development by increasing the likelihood that children of color will be placed in lower quality child care settings. 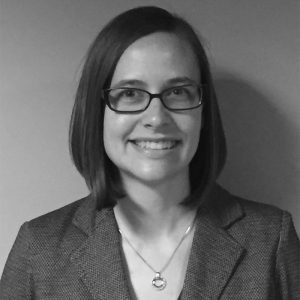 How Michigan Children and Families Are Faring: Michigan has a history of effectively covering children through the Medicaid and MIChild programs, with the percentage of children uninsured consistently below the national average. With the Affordable Care Act, the rate of uninsured children dropped even further. However, the state’s children of color still have less access to needed physical and mental healthcare, are more frequently born underweight and die before their first birthdays, and face environmental injustices related to exposure to toxins in their homes and neighborhoods. Fewer children of color have access to private health insurance. 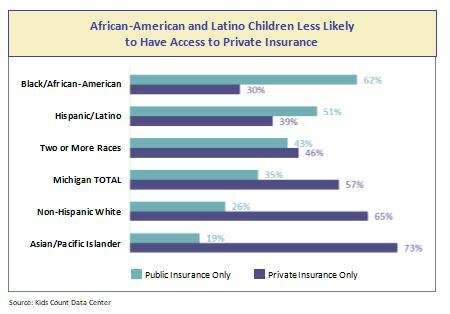 As a result of historical and current barriers to a high-quality education and career path for many African-American and Latino parents, their children have less access to private health insurance. 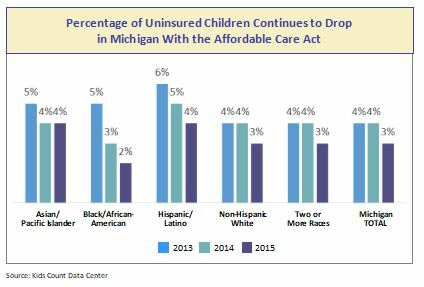 Two of every 3 African-American children—and half of Latino children—in Michigan rely on public health insurance programs for healthcare coverage. Consequently, improvements in access to comprehensive publicly funded healthcare coverage can significantly improve equity for children. Fewer women of color are receiving early prenatal care and more of their children do not survive to celebrate their first birthdays. In its recent Kids Count Right Start report, the League documented racial and ethnic disparities in maternal and child health. Among the problems facing mothers and their babies are maternal smoking during pregnancy, preterm births, the lack of access to timely prenatal care and a higher frequency of infants born low-weight. Of great concern is that African-American, Hispanic and Middle Eastern infants are much more likely to die before their first birthdays. The infants most at risk are those born prematurely with low birthweights, babies born to mothers with low incomes or covered by Medicaid, and babies that are the result of unintended pregnancies. 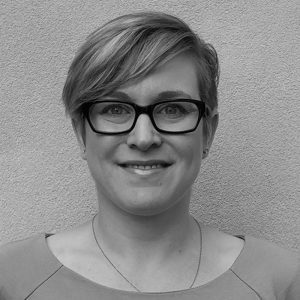 The reality is that access to healthcare coverage—which has expanded—does not ensure that pregnant women are able to find a provider within a reasonable distance from their home who will accept them as patients; or overcome the many barriers to adequate care, including provider bias or language and transportation issues. 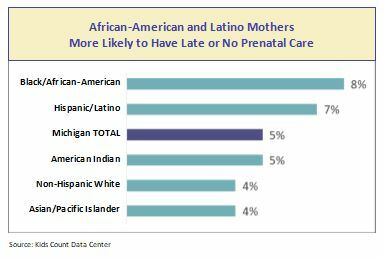 As a result of these barriers, African-American and Latina mothers are much more likely to receive late or no prenatal care, and their children are more likely to be born too early and too small. 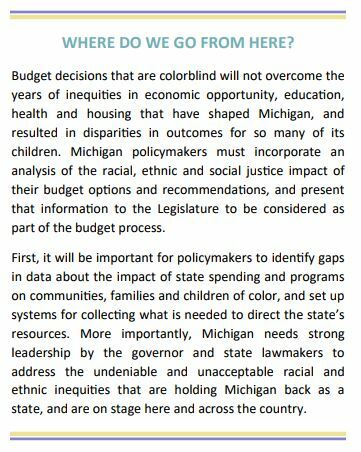 Budget Decisions Affecting Children’s Health: While Michigan continues to invest in healthcare coverage for children and families, access to physical and mental healthcare for families with low incomes and children of color remains a problem. 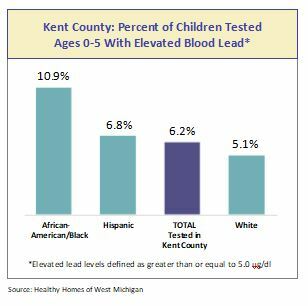 In addition, Michigan has failed to invest adequately in the public health infrastructure needed to ensure that all children are born healthy, that pregnant women and new mothers—particularly those of color who are now underserved—have access to healthcare and adequate supports in the difficult job of parenting, and that children are not subject to the types of environmental injustices that made Flint’s lead exposure crisis a national disgrace. 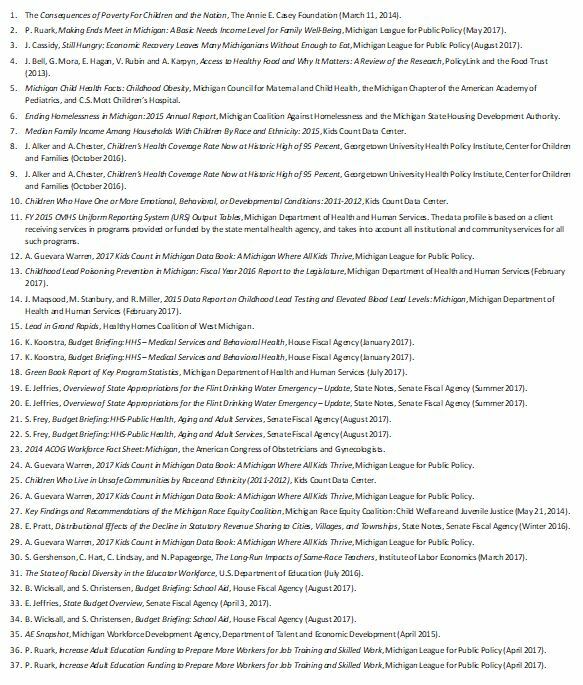 The Michigan Legislature made some significant investments to support the health of Michigan’s children, but missed several other opportunities to better care for kids. Established pilot projects to integrate the administration of behavioral health services. 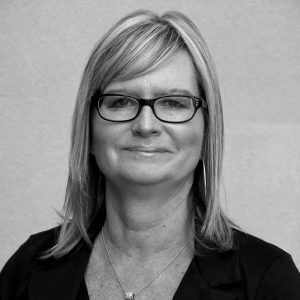 The Legislature moved forward on the controversial integration of physical and behavioral health in Michigan by authorizing a pilot project for full integration in Kent County, as well as three demonstration projects that integrate financing. The stated goal is to test how the state can improve outcomes and efficiencies in serving persons receiving behavioral health services. Provided a small funding increase to address the need for transportation for families seeking healthcare. The governor had proposed an expansion of the current transportation programs in Macomb, Oakland and Wayne counties, where there are contracts for coordinating transportation for persons needing nonemergency care. In other counties, families must rely on local Department of Health and Human Services (DHHS) workers—who are already stretched thin—to coordinate transportation. The final budget includes $1.4 million to expand the use of local public transportation. 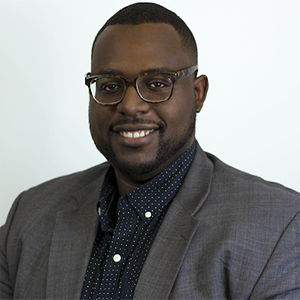 Children and families of color are more likely to be covered by public health insurance programs like Medicaid and the Healthy Michigan Plan, but access remains a problem—in part because of difficulty finding providers within a reasonable distance from home, as well as less access to reliable transportation. Included $1.25 million to begin implementing the recommendations of the Child Lead Poisoning Elimination Board. The Board was created by the governor in 2016 and made 80 recommendations for state action. Added legislative intent that more be done to encourage access to prenatal care. As of 2014, there were 5.1 obstetrician/gynecologists (ob-gyns) for every 10,000 Michigan women ages 15 to 25, which is below the national average, and 28 of Michigan’s 83 counties did not have any ob-gyns—furthering the likelihood that families with fewer resources are unable to find care.23 Because women with low incomes and women of color have less access to prenatal care, initiatives to improve access can also improve equity and outcomes for newborns. The 2018 budget adds language requiring the DHHS to engage in outreach activities that will encourage early, continuous and routine prenatal care, and promote policies and practices that improve access to prenatal and obstetrical care. Unfortunately, this budget language is not connected to adequate funding. 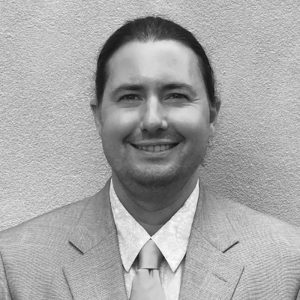 Eliminated a health innovation mini-grant program. The Legislature eliminated the $1 million Health Innovation Program that provided mini-grants to a range of community agencies. Among the current grants are efforts to provide housing for homeless people being discharged from the hospital; increase access to healthy foods for teens, parents and persons with chronic illnesses; add physical activity to summer feeding programs; train students of color to become Certified Nurse Aides or in other allied health careers; promote breastfeeding by African-American women through peer mentoring; and link people in supportive housing to primary healthcare services. A long history of racial and economic inequality, along with racial segregation, have led to gross differences in the resources available in the neighborhoods many Michigan children of color grow up in. Too frequently children of color are living in high-poverty areas where safety is a concern, and access to parks, fresh food, and after-school and other enrichment activities is limited. In addition, the barriers and economic stresses facing parents in lower-income communities of color often affect their ability to provide the support and care their children need. 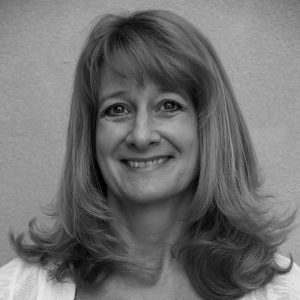 High rates of maternal depression with limited access to mental health and substance use disorder services, the scarcity of jobs providing a living wage, problems finding safe and reliable child care, inadequate transportation and substandard housing are all examples of the stresses facing parents. 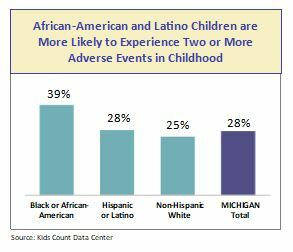 Four of every 10 African-American children in Michigan have been exposed to two or more adverse childhood experiences, including frequent economic hardship; parental divorce or separation; parental death; parental incarceration; family violence; neighborhood violence; living with someone who is mentally ill, suicidal or has a substance use disorder; or facing racial bias. Research shows that these adverse childhood experiences can have long-term effects on children, including poor health as adults, learning and behavioral issues, and adolescent pregnancy. Contributing to the problem is the high level of family stress resulting from the lack of economic opportunities for families of color and related high child poverty rates. Of the confirmed victims of child maltreatment, approximately 8 in 10 show evidence of neglect—including conditions related to poverty such as a failure to provide adequate food, clothing, shelter or medical care. 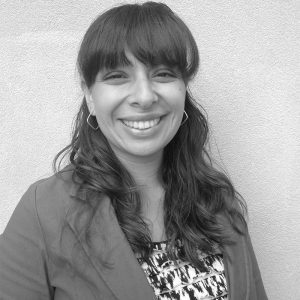 Provided a small increase for social services offered by multicultural organizations. The 2018 budget expands funding for social services programs for a range of organizations, including the Arab Community Center for Economic and Social Services (ACCESS), the Arab Chaldean Council, the Jewish Federation and the Chaldean Community Foundation. Funding for the programs is currently at $13.3 million. Increased rates paid to private agencies for foster and residential care for abused and neglected children. The 2018 budget includes $14.2 million for rate increases for providers of foster care, independent living, family reunification and residential services. Expanded funding for the recruitment and support of foster families, as well as the Michigan Youth Opportunities Initiative (MYOI). 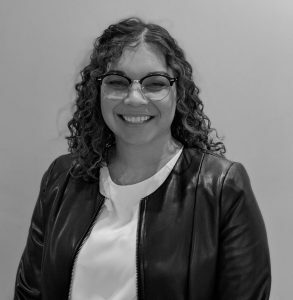 Because children of color are overrepresented in the state’s foster care system and are more likely to age out of foster care as young adults, efforts to find stable, high-quality foster homes, as well as services to improve the transition to independence are critical in reducing inequities. The Legislature approved the governor’s recommendation to spend $3.6 million to support regional resource teams to recruit, train and support foster families, as well as an expansion of the MYOI programs. Reduced funding for family preservation. In 2018, family preservation programs will be cut by $6.1 million. The funds were used this year for Parent Partner and family reunification programs in Macomb and Genesee counties and are intended to prevent the need for foster care and reunify children with their families when it is safe to do so. Programs that help build on family strengths, prevent out-of-home placements of children and facilitate reunification can be of special benefit to families of color and families with low incomes—both of which are overrepresented in the state’s child welfare system. 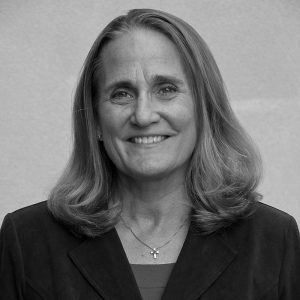 Unfortunately, the state has invested far too little in family preservation and prevention services that could help reduce the stresses families with fewer resources face, and enhance parents’ ability to care for and nurture their children—including access to sufficient income supports needed for stable housing and other basic needs. 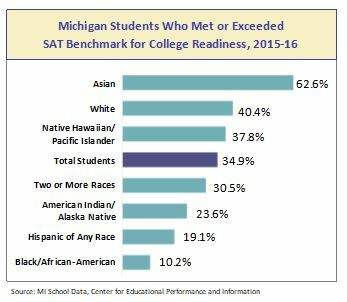 A high-quality education is a vital path to equity for children in Michigan, yet the data show that Michigan has a long way to go. Children of color have less access to high-quality early learning experiences and face barriers throughout the educational system. More needs to be done to ensure all children have access to supports that can improve their ability to learn—beginning before birth. Learning begins with a healthy mom and a healthy birth, and is at its peak in the earliest years of life. Michigan has made strides in making sure that 4-year-olds from families with low incomes have access to preschool, but there is no state funded preschool program for 3-year-olds, and funding for services for infants and toddlers and their parents are grossly underfunded. Statewide, access to a preschool education is more limited for Latino children, with 59% of 3- and 4-year-olds not in preschool.29 The research is strong. Access to high-quality early learning and family support programs—beginning at birth—is one of the best tools we have for overcoming disparities in achievement and ultimately in earnings. Students of color are more likely to be in families with low incomes. 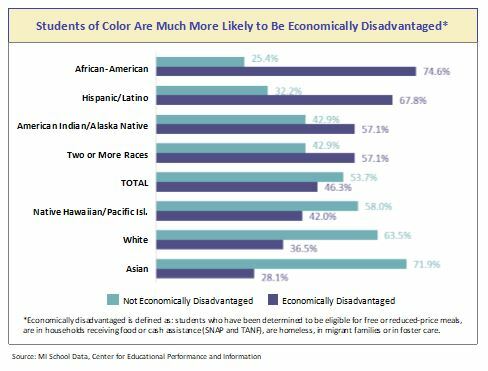 Because of the indisputable connection between family income and student achievement, the high level of economic disadvantage faced by children of color is a stark reminder of broader social issues that result in inequities in educational achievement. Three of every 4 African-American students and two-thirds of Latino students in the state are considered economically disadvantaged because they: (1) are eligible for free or reduced-price school meals; (2) are in households receiving cash or food assistance; or (3) are homeless, in migrant families or in foster care. 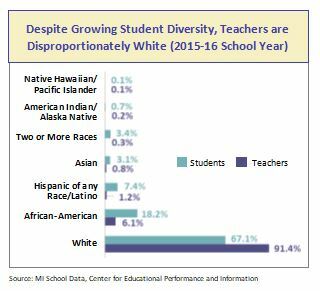 Racial and ethnic disparities affect educational out-comes. While there are inequities in educational achievement in all subjects, significant focus has been placed on reading by third grade, including Michigan legislation that allows for retention of students in certain circumstances. In the 2015-16 school year, 20% of African-American students were reading proficiently by third grade, compared to 54% of their White counterparts. More than half (56%) of African-American third-graders would have been subject to retention if the policy had been implemented in 2015-16, compared to only 21% of White students. 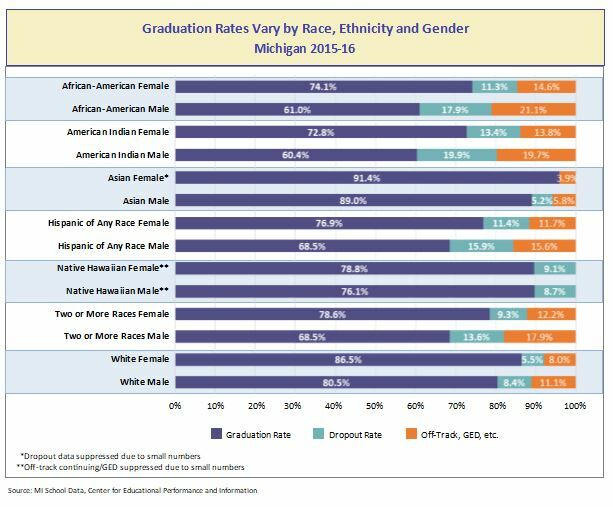 Graduation rates vary by race, ethnicity and gender. While the state’s high school dropout rate has been falling, high percentages of children of color are still not graduating, and young men of color are at the highest risk. In the 2015-16 school year, 18% of African-American boys and 11% of African-American girls dropped out of school—significantly above the rates for their White peers at 8% and 6% respectively. Latino youths were approximately twice as likely to drop out of high school as White youths. African-American and Latino young adults are less likely to be ready for college after graduating from high school. Reflecting diminished opportunities beginning early in life and accelerating during the school years, only 10% of African-American students and 19% of Latino students met or exceeded the SAT benchmark for college readiness in 2015-16. 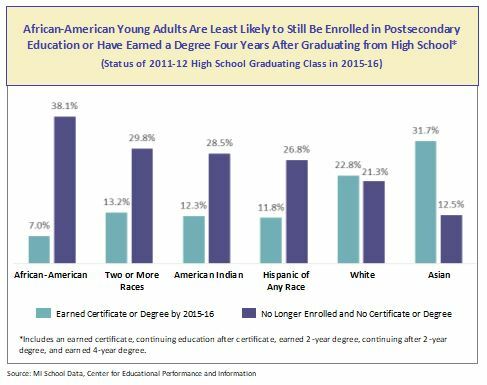 As a result, African-American and Latino youths are less likely to pursue postsecondary education within six months of graduating and are much more likely to require remedial coursework once in college. Educational inequities persist, affecting success in college. Even when young men and women of color are able to enter college, financial and other barriers to their continued success remain. Four years after graduating high school and directly entering a postsecondary program, 38% of African-American students are no longer enrolled and have not completed a degree program, and only 7% have completed their degrees. By contrast, 23% of White students completed their postsecondary program in four years. Increased per-pupil spending with larger increases for districts currently receiving the lowest payments. The Legislature approved an increase of between $60 and $120 per pupil, using a formula that benefits districts with lower payments. Two of every $3 in the School Aid budget are used to support per-pupil payments, which are the primary source of funding for school operations. The At-Risk School Aid program is the state’s best vehicle for addressing the educational challenges faced by children who are exposed to the stresses of poverty and has the potential to help improve equity for children of color. After a decade of flat spending, increases in the current and upcoming budget years have expanded the program by over 60%—a positive and needed move in the right direction. 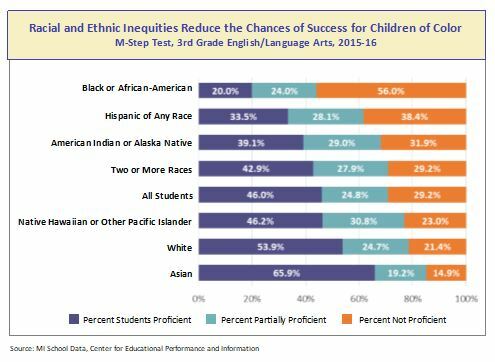 Failed to provide sufficient funding to address racial and ethnic disparities in early literacy. Proficient reading by the end of third grade is critical. A child’s ability to read by third grade is an important predictor of whether or not he or she will drop out of school, find regular employment or even end up incarcerated. By the time children enter kindergarten, there are already large gaps in vocabulary between students from families with low and higher incomes. State law now allows for grade retention if children are not reading proficiently by third grade, so the stakes are high—particularly for students of color who are disproportionately at risk of retention. For the retention legislation to be successful and avoid contributing to racial and ethnic inequities, it is critical that there be sufficient funding for the services needed to address the cumulative impact of inadequate early learning opportunities for children of color, including the early identification and treatment of developmental delays and high-quality child care and preschool. Increased funding for early literacy coaches. For 2018, $3 million in new funds will be available to double the amount available for early literacy coaches to $6 million statewide. The consolidation of other early literacy funds. 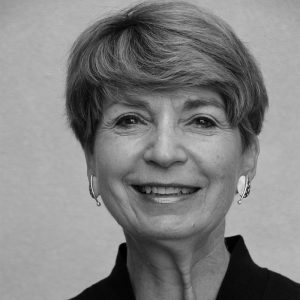 The Legislature consolidated a total of $20.9 million that is currently allocated to early literacy for professional development, screening and diagnostic tools and added instructional time—with funds to be distributed to districts in an amount equal to $210 for every first grade student. Funding for professional development and diagnostic tools are both capped at 5%. Continued Michigan’s sad tradition of providing too little financial aid for students with low incomes. College tuition more than doubled at almost every state university between 2003 and 2015, making the state’s average tuition cost the sixth highest in the nation and second highest in the Midwest during the 2015-16 school year. Further, Michigan invests far less in needs-based scholarship grants proportional to its student population than most other states, and has completely eliminated state financial aid for students who have been out of high school for more than 10 years. Michigan currently spends less than half the national average of state spending on needs-based tuition grants. Given the barriers that young people of color face in being prepared for and able to afford college, the lack of investment in financial aid is a clear component of the cumulative impact of racial and ethnic disparities in educational achievement and ultimately earnings. Tightened the tuition cap for universities. 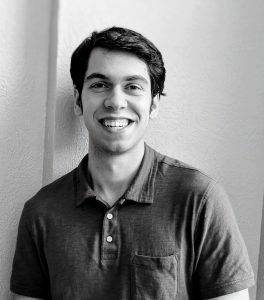 Michigan has adopted a “tuition restraint” policy requiring public universities to limit tuition increases to no more than 3-4% each year in order to receive full state funding. 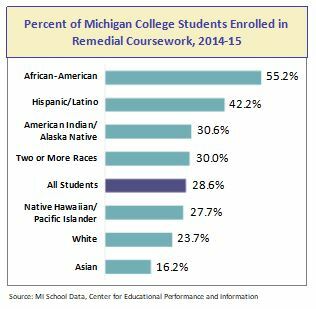 While a small move in the right direction, given the steep tuition increases that universities have already put in place, this change does little to reduce the high cost burden faced by students in Michigan universities, and precludes many young people of color from entering and completing four-year degree programs. 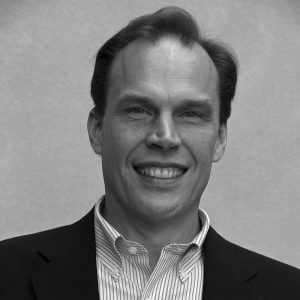 Slightly increased funding for financial aid programs. The amount of the grants is still not enough to significantly help students pay high tuition costs, however. Failed to provide financial assistance for students who have been out of high school more than 10 years. 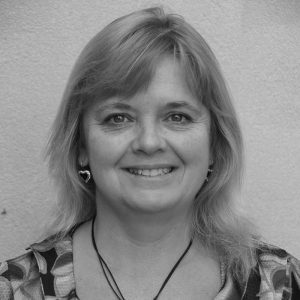 The Part-Time Independent Student Grant, which helps older students, was eliminated in 2010. There have been efforts since 2015 by the Legislature and the governor to reinstate the grant, but they have failed to be signed into law. For the 2018 budget year, the governor recommended $2 million for the grant, but the Legislature rejected that proposal.